Grace helps me do for my spouse what I, in my laziness, don’t want to do. Grace helps me love my spouse when they have wronged me. Grace helps me overlook things my spouse does or doesn’t do that irritate me. Grace helps me see my spouse through eyes of faith, not doubt. Grace helps me put off anger and walk patiently with hope. Grace helps me love my spouse in the way Christ has loved me. Grace helps me say no to quitting, and yes to forbearing. Grace helps me believe the best when I’m tempted to think the worst. Grace helps me work on the log in my own eye before bringing up the speck in my spouse’s. Grace helps me extend grace to my spouse even when they don’t deserve it. 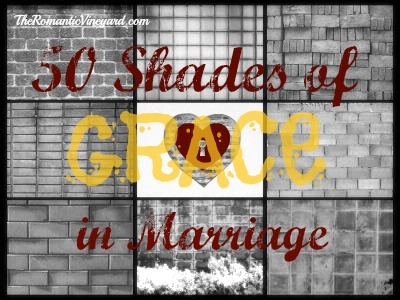 This entry was posted in Christian Marriage, Growing Strong Marriages, The Gospel & Marriage and tagged 50 Shades of Grace, 50 Shades of Grace in Marriage, Christ, Christianity, Divine grace, God, Grace, Jesus, Religion and Spirituality, Theology. Bookmark the permalink.